In previous Blogs I have alluded to poetic licence for using language, words and grammatical punctuation for comic or dramatic effect. 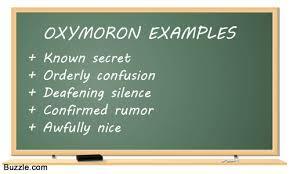 This week I want to talk about oxymora, the plural of oxymoron, a pretty ugly word in its own right – don’t you think? Oxymora are a proper subset of the expressions called contradictions in terms. What distinguishes oxymora from other paradoxes and contradictions is that they are used intentionally, for rhetorical effect, and the contradiction is only apparent, as the combination of terms provides a novel expression of some concept, such as ‘cruel to be kind’. Many oxymora are used as a matter of discourse and are no longer considered to be contradictions; let alone a novel expression of concept. I site the following in that list: the living dead, old news, seriously funny, near miss, same difference, together alone. A couple of my favourites are: ‘your silence is deafening’ and ‘the silence sales person’. I prefer salesman but recognise that it is not politically correct! Mmm politically correct – is that not an oxymoron? I also like the idea of ‘tax return’ and ‘doing nothing’, but hate the concept of ‘one size fits all’ or the ‘non-alcoholic beer’! How many oxymora can you identify in the following clip. At first count I have 31? Welcome back! I get fed up by 4 because I find youtube takes ages to load! Shame! I must ask daughter how much she’s downloaded this month!